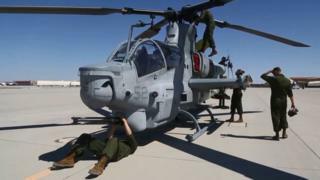 The pilots were taking part in a "routine training mission", the Marines said in a news release. Their mission was part of the "Weapons and Tactics Instructor course 2-19", the Marines said on Sunday. The base is located about 2 miles (3.2km) from Yuma, in the southwestern part of Arizona near the US-Mexico border. In a tweet on Sunday, the Marines said: "Our condolences go out to the families and friends of our two pilots who we lost last night in Yuma".